President Trump, Tear Down These Walls! As I write this post from India, the reactions of protest, anger and fear continue here on news of a third attack in the last two weeks on an Indian immigrant in the US. This last one was near to where we base when we are in the states, a small extremely multicultural city called Kent, Washington. This crime, supposedly with the attacker shouting “Go back to your country!”, is being investigated along with the previous two as hate crimes by the Federal Bureau of Investigation (FBI). The Indian-American community in the US is millions strong, and highly integrated. They are in many cases deeply involved in political service, including Governors Bobby Jindal of Louisiana and Governor Nicki Haley of South Carolina, now the US Ambassador to the United Nations. I am originally from the USA myself, and it is disturbing to think of our country as a racist society, but unfortunately much of the ignorance and fear of the rest of the world actually comes from an un-examined racism. Of course not in every case or every American, but far more than is willing to be acknowledged. So why is this blog post titled the way it is? Are all these attacks President Trump’s fault? By no means. 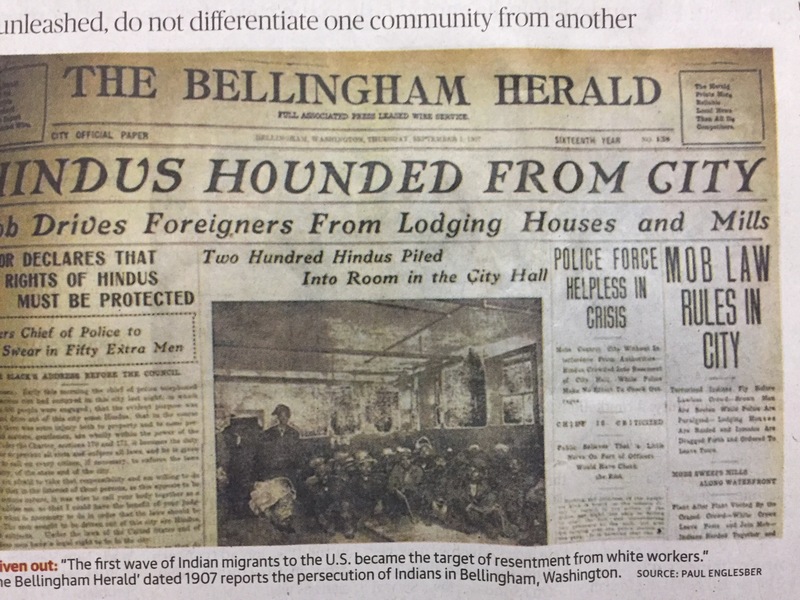 As my accompanying photo shows, in 1907 in Bellingham, the same state of Washington as the recent Kent attack, over 200 Indian Hindu migrants were rounded up and hounded out of the city. This was part of a continuing campaign in Washington state in these first few years of the 20th century to expel the Chinese communities as well. Many of the Chinese were loaded onto trains, sometimes with only hours notice, and sent South to cities like San Francisco. Racism and xenophobia in American society is not new, and did not originate with President Trump and his administration. But he must do more to stop it, and not create an environment where it can come out of its dark places in the human heart even more strongly. The President did in some ways condemn the climate of hate in his speech to Congress last week, but he must be consistently speaking out more to tear down these walls, or at least knock out a few bricks. There are a few important actions the President should do to tear down these walls, as soon as possible. As with any elected leader, whether from any party or any nation, there must be a strong sense of representing EVERY person in their nation, whatever place of origin, sexual orientation, religious faith. President Trump, stop using the terminology of ‘America First’. As I have written about before when he was only running for President, this phrase was used in the 1930’s and heartens back to not only an economic isolation, but a racist one as well. President Trump, speak out regularly right now against these attacks and the seemingly growing climate of hate in the country. Yes, every leader needs to do this, and perhaps none do it enough. President Trump, say to Steve Bannon “you’re fired!” It is of course not clear how much influence he and the alt-right movement have on the President, but what is clear is his paper trail of comments and rhetoric. President Trump, stop the immigration bans completely, or at the very least do them in a different form that would be much more bi-partisan and well thought out. Yes, he was elected promising to “Keep America safe”, but even after the 90 day period expires is it clear what will come next? President Trump, don’t build the wall with Mexico. Build bridges instead with better thought out solutions. These are just a few things that could be done to knock a few bricks out of the walls of hate, racism and xenophobia in the United States. President Trump did not create the problem. It is deep in our national psyche as Americans. But like any President, he will be held accountable on what direction he takes the nation in the coming years. Do you mean in the title of the blog? If so, A.D. is short for in Latin Anno Domini, or “year of our Lord”. It commonly means “after death” in the sense of after the death of Jesus. Did I understand your question correctly? I shared it my Facebook time line. Praying for your Nation (U.S.A) more in these days and your new President Trump. Next Post Will the Slave Trade Ever End?